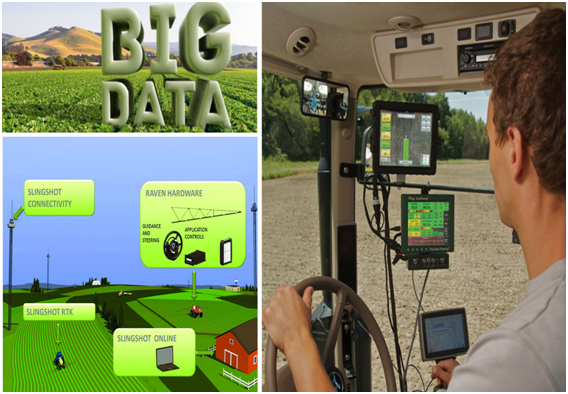 How big data can transform (or improve) agriculture through the adoption of big agri-food data? The first step is to have the proper precision agriculture technologies, such as guidance, variable rate and yield monitoring, in place and have experience with it (Building your infrastructure base). “Big data technology represents a disruptive innovation that market orientated organizations will use to drive competitive advantage and governmental bodies to set and reach policy targets. The value of big data lies in the insight that organization can draw from it, rather than in the information itself” (Big Data at Wageningen UR). Big data is characterized as having extreme or variable values of one or more of the following characteristics: Volume, Variety, Velocity, Veracity, Variability, Complexity, so it is a rather “complicated topic, not only from a technological and analytical standpoint, but also from a legal, ethical, and regulatory standpoint. The number of key players continues to grow, as does the list of benefits and challenges” (Big Data in U.S. Agriculture). In addition, the recent multiplication of open access initiatives to big data is giving momentum by widening substantially the spectrum of users as well as awareness among the public while offering new opportunities for scientists and value-added companies. Big data is believed to be a solution to many pressing economic and societal challenges. More and more companies and communities today realize that they’re not going to be competitive if they can’t put their data to perform analytical, precision, logistics, decision making, forecasting and other tasks supported by Information Technology (IT) related services. As a matter of fact, big data is a growing trend in the IT sector serving different fields of knowledge and application areas (comprised agriculture: food safety, food sustainability, crop improvement, marketing and improving the food chain) and having the main goal to improve the functions or processes in which they are involved. The “special thing about big data in agriculture is its extreme variety … This is what you get, if you contrast the four (as IBM suggests) V’s of big data to the data types and sources that are typically used in agricultural, food and environmental research” (BigDataEurope workshop). Big data may change the way of the digital farms. Meanwhile to put firmly information to work in the wide sense may mean building the road first that can enable to experience with data. In agriculture sector that may mean to have in place the proper precision farming technologies, smart agriculture IoT (Internet of Things Technologies) solutions, wireless technologies, cloud computing, etc.. All that is important that your farm’s data infrastructure is more robust than in the past (see: agINFRA infrastructure sharing digital agricultural content). Big data implies the expanding of data universe and requires higher-speed connections, “to gain both uplink and downlink rates, consistent data linkage, and security to more large amounts of data in real time between machines and the cloud,” says John Fulton, associate professor of Agricultural Engineering, Ohio State University. United States Department of Agriculture (USDA) - using 21stcentury tools and big data sets - is moving its Agricultural Marketing Service (AMS) into the Market Analysis and Reporting Services (MARS) era, thus making qualitative big data available in a searchable data base, plus opening the door to providing content that is defined by the public and supplements data with statistics. MARS will “ensure that farmers and ranchers know they’re getting a fair price, wholesalers make better decisions about what and how much to buy, and commodity traders buy and sell based on current market information” (USDA Market News). To help drive precision and prescriptive farming and develop proper management zones it is necessary to collect quality yield data and to reduce duplication in data collections (e.g. 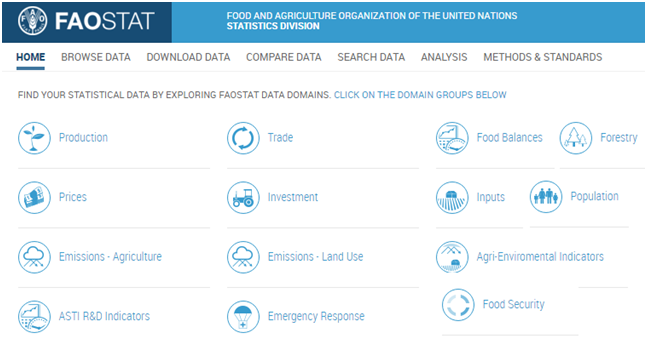 collections of quality data in FAOSTAT, part of the FAO mission to improve data sharing for development and the fight against global hunger and malnutrition). Collecting data and moving it to the cloud is an important precondition for creating an interconnected digital ecosystem that tracks commodities (from advisers to information providers, so as from different farm companies to the market) and helps making informed agricultural decisions. The need for understanding and combining different types of data led to the rapid development of the data science and big data analytics - exciting new areas that combine scientific inquiry, substantive expertise, programming, and statistical knowledge. “A combination of big data sources is generally analyzed and packaged into an easily understandable and useful product. These can cover the spectrum of qualitative analytical products: descriptive products (e.g., those that provide a better or more advanced way of looking at an operation); prescriptive products (e.g., those that provide timely recommendations for operation improvement based on real-time and historical data); and predictive products” (Big Data in U.S. Agriculture). “For now, big data, despite its immense promise, remains a sleeping giant with much of its potential still locked in the yield monitors and other precision farming technologies that farmers use routinely” (Big Data Primed to Transform Farming). The majority of agriculture-related data is still paper-based, spread over different systems (sensor data, satellite images, crowd-sourced data and information collected through social media etc.) and difficult to exchange between the people who want to access it. A new action research programme FarmDigital is working towards a situation in which data only needs to be entered once and can be shared and used easily. FarmDigital aims to achieve this goal by standardizing data and developing and implementing an independent, digital platform for people to use (About the FarmDigital Program). Indeed, “As farmers turn to more sophisticated data tools, the infrastructure will have to keep up” (Building your infrastructure base). The cost and efforts required for introducing big data technology in a value chain is significant. “Don’t let your enterprise make the expensive mistake of thinking that buying tons of proprietary tools will solve your data analytics challenges” (CKM advisors). Take a quick look at the news coming from a new European project HOBBIT (Holistic Benchmarking of Big Linked Data) that develops a holistic open-source platform and industry-grade benchmarks for benchmarking big linked data. “HOBBIT aims at abolishing the barriers in the adoption and deployment of Big Linked Data by European companies, by means of open benchmarking reports that allow them to assess the fitness of existing solutions for their purposes”(HOBBIT). Can your organization benefit from the HOBBIT platform? By filling in this survey before May 29th, you will automatically have a chance at winning an Amazon voucher.